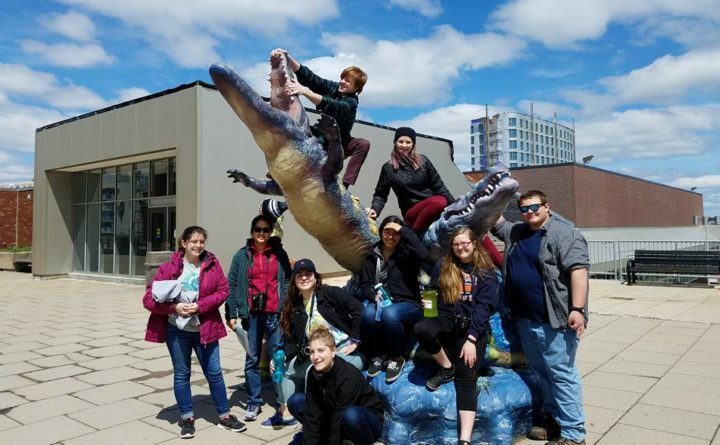 In April, Trekkers Team Allagash and Team Penobscot completed their 11th grade College/Career Exploration expeditions. A total of 23 students and 10 adult mentors (Team Allagash had 10 students and 5 leaders; Team Penobscot had 13 students and 5 leaders) explored college and career path opportunities during their expeditions throughout New England. The students embarked on their respective trips on April 13. Prior to their expeditions, each student worked throughout the school year to narrow down their top selections. Senior Manager of Programs Alaina Ennamorati and Program Manager, Hannah Tannebring then created itineraries from the students’ choices. Team Allagash chose the following schools to visit during their 10-day expedition: Unity College, York County Community College, Middlebury College, Champlain College, Green Mountain College, Word of Life Bible Institute, UMass Amherst, University of Connecticut, Montclair State University, UMass Boston and Global Quest – a gap year program based out of Northampton, Massachusetts. Team Allagash met up for a few hours with Team Penobscot in Beverly, Massachusetts for a cookout before they did a ghost tour with Jeremiah Poope in Boston. The team members also participated in a conversation about program opportunities with AmeriCorps with input from Trekkers staff and AmeriCorps members. Team Penobscot visited a total of fifteen schools on their expedition. The students and leaders visited the following schools for a tour led by a recent Trekkers alum: Bowdoin College (with Bri White-Ortiz, Trekkers class of 2017) and Roger Williams University (with Kyle Waters, Trekkers class of 2016). They visited the following schools on a guided tour: University of New England, Yale University (private tour with the Dean of Student Affairs), Middlebury College, University of Vermont, Norwich University, Mass College of Art and Design, Gordon College, and Boston College. In addition, the students used the iPad in small groups to conduct research on schools they did not have scheduled tours at, and led the rest of the group in self-guided tours as the “expert” on the school. The following schools that were student-led included: New England Technical Institute, Dartmouth College, Boston University, Northeastern University, University of New Hampshire, and Colby College. In addition to visiting colleges, Team Penobscot participated in a tour and information session at City Year in Boston, to learn more about Americorps programs, and potential gap-year possibilities if students felt unsure of their career path at any point. The team also participated in guided Yoga and Meditation at Yoga By Donation in Portsmouth, NH, explored the city of Burlington, Vermont, participated in a “Trekkers Got Talent” talent show, and went on a Ghost Tour through Boston with Jeremiah Poope. In addition to touring the campuses, each evening the students from both teams shared meaningful discussions and impressions about the schools they visited, talking about financial aid, and where they could see themselves being most successful. The 11th grade expeditions are designed to help students focus on life beyond high school, giving them a greater understanding of how to make the transition from adolescence to adulthood, and from being fully dependent to completely independent. Trekkers is a non-profit organization providing a long-term program that connects young people with caring mentors and leverages out-of-classroom expeditionary learning to help them grow into resilient and responsible adults. Trekkers was founded in 1994 as an outdoor-based, youth mentoring organization that now serves 240 seventh through twelfth-grade students from the Midcoast communities of Owls Head, Thomaston, South Thomaston, Rockland, Cushing and St. George. In 2017, the Trekkers Training Institute was founded to train other youth development professionals throughout the state in the Trekkers model. For more information about Trekkers, please visit www.trekkers.org or call 207-594-5095.